What would you do with an extra $500, $1,000 or even $5,000 per month? Would your family be in a better place? Would you be able to stop stressing about money? Would you finally be able to pay off your debt? Or plan that trip to Disney before your kids are too old? What if you could do that in about 20 minutes per day using the knowledge and skills you already have? Well, after spending nearly 12 years in digital marketing, helping businesses, I'm spending the next few years helping families. Individuals. People like you. Like family, working from home, adopting, giving more, or leaving that dead-end job to do work that's more fulfilling. This free course is my way to help you get started. Enroll in this SuperSimpl Email Course, FREE... for a limited time! 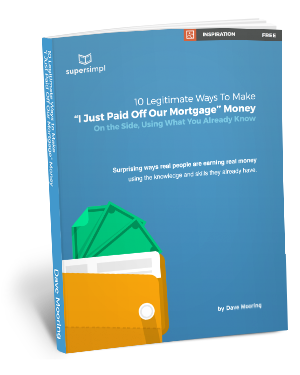 "10 Legitimate Ways to Earn 'I Just Paid Off Our Mortgage' Money"
I don't spam and won't share your email. 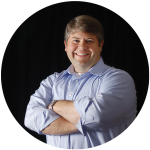 [This] is an excellent resource if you want to grow and nurture your online presence. 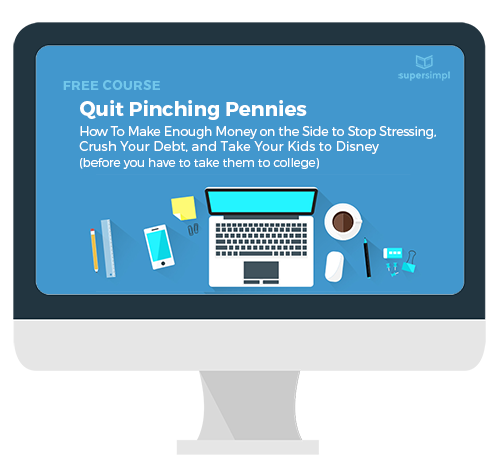 The SuperSimpl Quit Pinching Pennies course, is a 12-part email course designed for busy people who are struggling to find the financial freedom they need to focus on what matters most. Learn how to turn your existing knowledge and skills into a steady monthly income stream. Even if you don't have a clue where to start, and you're not really sure you have anything unique or special to offer. Copyright © 2011-2017 BurlapSky, Inc. dba SuperSimpl. All Rights Reserved.